Should Mass. Pike remain elevated or come back to earth? The state needs to replace the turnpike viaduct in Allston and seeks to straighten the highway near former train yards. Talk to neighbors and transportation activists, and you’ll get pretty much the same answer: The best option for replacing the aging Massachusetts Turnpike viaduct in Allston is a new stretch of highway at ground level. Ask state Transportation Secretary Stephanie Pollack, who will make the final call, and, well, she’s still wondering if the state should just build another viaduct. 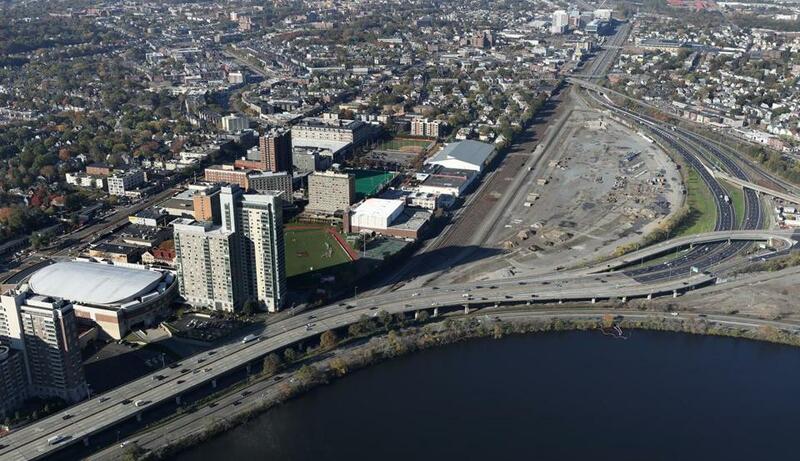 Pollack will know more soon, when a consultant is expected to weigh in with a deep analysis of the options for the $1 billion-plus project to straighten the turnpike where it curls around an old rail yard in Allston, the biggest local highway project since the Big Dig. The debate centers on a similar key question the state faced when it was time to replace the Central Artery downtown: keep the road elevated or not? The decision this time will shape the western gateway to Boston for generations and may result in more public access to a desolate stretch of the Charles long hidden behind Boston University by the highway viaduct. “Any project like this is more about city building than getting people from point A and point B,” said Rick Dimino, president of the nonprofit group A Better City, which supports putting the highway at ground level. The main driver of the project is the poor condition of the viaduct, but the straightening will produce an enormous side benefit: unlocking dozens of acres of land in Allston owned by Harvard University for development. While transportation advocates and nearby residents have been fighting the state over the timing of a new rail station in the Harvard-owned section of the project, the question over replacing the viaduct has been another major point of contention. Activists strongly favor putting the highway at ground level alongside Soldiers Field Road, arguing that it would be easier to build pedestrian bridges and other access points to the Charles than having to negotiate around a new 30-foot viaduct or the railroad tracks underneath. Eventually, putting the Mass. Pike at grade could also spur development and allow for the construction of decks over the wide stretch of roads and railways that could accommodate new parks, activists say, though Boston developers have struggled for years to complete projects over other parts of the turnpike. Few, if any, members of the neighborhood or public have come forward to argue for a new viaduct — though some key environmental groups, including the Conservation Law Foundation, have yet to weigh in. But Pollack, the transportation department chief, said the state has to consider that option. A new viaduct would provide enough room for wider breakdown lanes, which would be more difficult to squeeze in at ground level, Pollack said. Moreover, the at-grade option might have trouble securing permits because it would be so close to parks and waterways. And building the highway so close to the riverfront may not be wise in an era of climate change, she added. “If, anywhere else in the Commonwealth, we wanted to take a road and put it in a flood plain, in wetlands, next to a river, at grade . . . most people would say that’s not a very resilient idea in a world where there’s going to be more downpours and flooding,” Pollack said. The all at-grade proposal has won considerable public support, and advocates see it as a no-brainer; by the Department of Transportation’s own estimates, it’s the least expensive of the three options and carries the lowest maintenance costs long term. Pollack said she is keeping an open mind and expects to make a decision by the end of the year if the state is to stick to its schedule of beginning construction in 2021, before the viaduct gets so old it cannot safely carry heavy trucks. Her choice will be informed by a team of consultants that is scheduled to soon report back with a deep analysis of the options. The review is being led by Jack Wright, a former state official who was involved in the Baker administration’s reworking of the big Green Line extension project after it faced major cost overruns. Wright declined to comment. But at a public meeting in August, he stressed that his group will assess and tweak the various options, but not recommend one to Pollack. Among the biggest issues is the geometry of the throat area. That stretch is so narrow that putting the turnpike at ground level might require moving the Paul Dudley White bike path out over the river by several feet. But filling in a portion of the river or building out over it could make it more difficult to receive environmental permits for the project. Supporters of the at-grade option argue the bike path difficulties should not be used as a justification for going with a viaduct. He and others argue that the highway can be designed at grade level without changing the riverfront to accommodate a short stretch of the bike path. The very same debate occurred when the extension of the turnpike to Boston was built in the 1960s — but to very different results. Back then, state highway officials called for filling in a portion of the river to run the turnpike at grade level. But their counterparts at a state conservation agency resisted, and the section of the highway was instead put on the viaduct, leaving the Charles untouched. More recently, other major elevated roadways in the Boston area have been targeted for a come down. The Big Dig buried Interstate 93 through Boston, opening the Seaport District for development and spurring a property revival along the Greenway. In Jamaica Plain, the old Casey Overpass over Forest Hills was torn down in favor of at-grade streets even though officials acknowledged it would slow traffic. The McGrath Highway viaduct in Somerville may also be replaced with an at-grade roadway in the future. Outside Massachusetts, state governments on the West Coast have turned toward replacing highway viaducts with tunnels due to earthquake safety concerns. But Pollack isn’t convinced that every elevated roadway must come down.